They say that breakfast is the most important meal of the day and to be sure, you shouldn’t go without it. A friend of ours claims coffee to be the most important meal of the day, but surely that would be the case only if you drink one cup or mug. Otherwise, what is the next or the next? I’m not sure, but… Also, Louise mentioned today that I seemed to be taking a long time on my coffee, which is what brought me to this post as it seemed logical (I know, right). And so, my morning coffee, which is becoming somewhat of a ritual, only to be changed when we have guests. Firstly, I measure two scoops of coffee beans into my hand grinder, set for a pretty fine espresso. I then take it back to my desk and sit down to read some internet stories while grinding, as it can take 5-10 minutes. 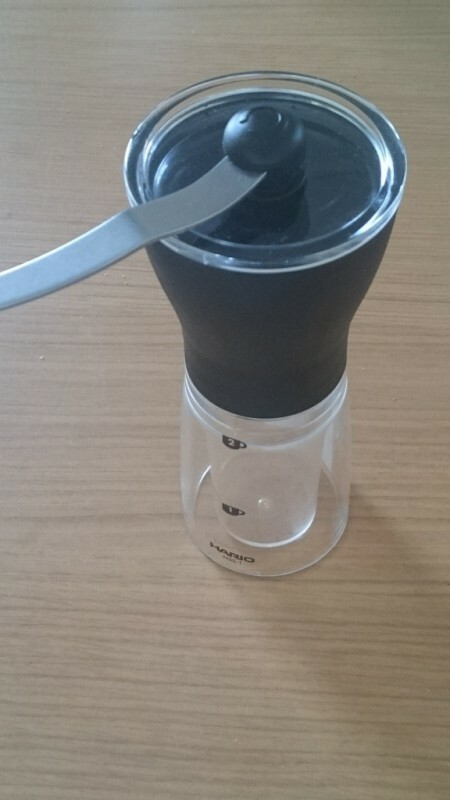 Next I boil some water and pour the freshly ground coffee intomyAeropress, recently using it in an inverted mode, and add the hot water. I then put a drop of milk in the bottom of a mug, and after a minute or so, put a filter onto the coffee, flip it upright and press it into the cup. I then add more milk if needed, and top up the mug with hot water. I take mug to my desk, and enjoy. I’m not entirely sure, but I think it takes longer to make than it does to drink. Still, as they say, good things come to they who wait. Next Post: You will be food!